Horizon Heights Condo Subdivision is one of the Oro Valley Condo and Townhouse subdivisions offering comfortable living and convenience to all Oro Valley AZ amenities. Horizon Heights is a small enclave of condos just west of Oracle Road at El Conquistador Way. The Horizon Heights Condo Subdivision was built in the late 1990’s. Horizon Heights is a very popular location for snowbirds looking to get away from harsh winters and cloudy days. Many of the units in Horizon Heights will have excellent views of the Catalina Mountains and Pusch Ridge. The Pusch Ridge view of the Catalina Mountains has been voted the best view of the entire range. The Pusch Ridge view is only available in Oro Valley AZ and makes Horizon Heights Condo Subdivision a very sought location in Oro Valley. Horizon Heights Condo Subdivision homes will start around $150,000 and go up to $200,000. The Horizon Heights Condo Subdivision in Oro Valley AZ has a Community pool and spa. Horizon Heights Condo Subdivision is served by the Amphitheater School District. If you are considering Horizon Heights Condo Subdivision for your winter retreat, then also take a look at El Conquistador Resort Homes, the Vistoso Resort Casitas , and Vistoso Village. All are located near the heart of Oro Valley AZ. Oro Valley families are served by the Amphitheater School District which is one of the statistically highest-performing public school systems in Arizona. Search for an Oro Valley Homes By School. 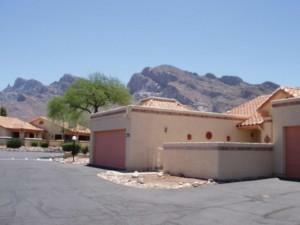 Horizon Heights Condo Subdivision is a small Oro Valley Subdivision with great Catalina Mountain views. Horizon Heights Condo Subdivision homeowners are close to the heart of everything in Oro Valley. If you are considering a home in Horizon Heights Condo Subdivision or another Oro Valley for your future full-time home, winter retreat or future place to retire, we can help.